Better known as essential fatty acids, or EFAs, Vitamin F is composed of two types of fatty acids: linoleic and alpha-linolenic. The body cannot produce EFAs by itself, so you have to get them from food sources where they are known as unsaturated fatty acids or polyunsaturated fatty acids. The health benefits to consuming EFAs are lower cholesterol and blood pressure levels and reduced risk of strokes and heart attacks. Different oils provide different types of essential fatty acids. Soybean, safflower and corn oils are good sources of linoleic acid. For example, one tablespoon of safflower oil containing 10.1 grams of linoleic acid. The average intake of linoleic acid--also known as omega-6 fatty acids--for adults in the United States is 12 to 17 grams per day for men and 9 to 11 grams a day for women, according to the Linus Pauling Institute at Oregon State University. The typical American diet contains 14 to 25 times as much omega-6 fatty acids as omega 3, according to the University of Maryland Medical Center. Flaxseed oil is the best source of alpha-linolenic acid, with one tablespoon containing 7.3 grams. Other good sources are walnut oil and canola oil. The average adult diet contains 1.2 to 1.6 grams per day for men and .9 to 1.1 grams per day for women, according to the Linus Pauling Institute. The best nut and seed source of linoleic acid are oil-roasted sunflower seeds, which have 9.7 grams per ounce. 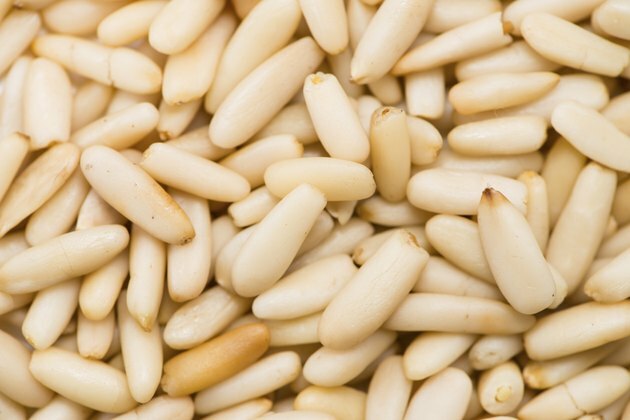 Other food sources are pine nuts, pecans and brazil nuts. Nuts are not the best source of alpha-linolenic acids, although some nuts do contain Vitamin F. English walnuts have 2.6 grams per ounce. Black walnuts also contain a small amount. Certain animal products also contain omega-3 fatty acids, particularly fish, such as salmon, tuna and halibut. The American Heart Association recommends eating fish twice a week to increase your intake of omega-3 fatty acids.